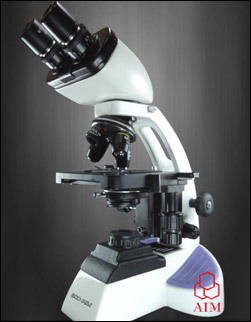 The future of classroom microscopy with crisp sharp image, more convenient in working, easy to move, light weight, durabillity, ergonomic design and affordable prices. 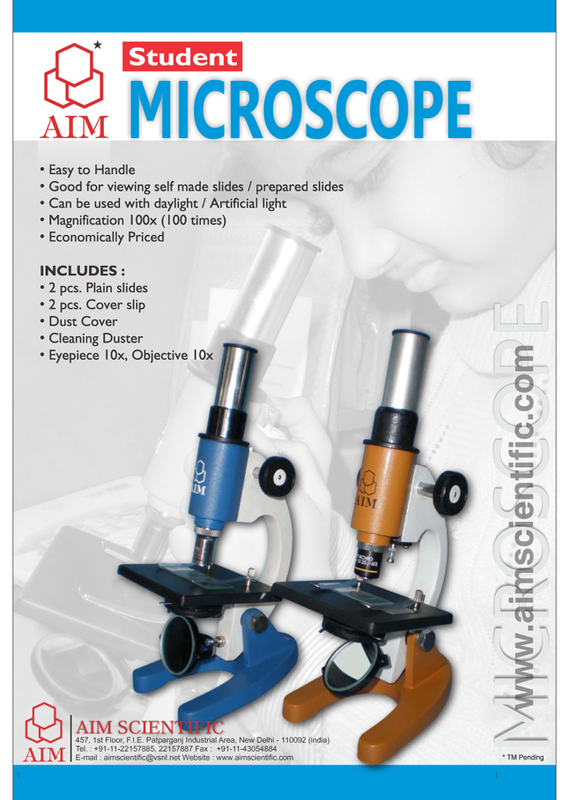 It became an ideal instrument for school laboratories, medical institutes, colleges and universities. Optical System : Finite optical system. Stand : Sturdy stand with anti rust materials. Magnification : 40x to 1000x for visual observation. Eyepiece : Widefield eyepieces 10x, FOV 18mm, antifungal coated. Nosepiece : Upright, quadruple nosepiece (Ball bearing type) with click stops and rubber grip. Mechanical Stage : Double plate stage size 140mm x 140mm. X/Y travel range 90mm x 65mm. Low drive right side movement controls. Ceramic coated surface for scratch resistance. Double specimen holder clip. Objectives : SP series DIN Semi Plan Achromatic objectives 4x (N.A. 0.10, W.D. 25mm), 10x (N.A. 0.25, W.D.6.7mm), 40x (SL, N.A. 0.65, W.D. 0.6mm) and 100x (SL, Oil, N.A. 1.25.W.D. 0.17mm) antifungal, antireflection coated. Condenser : Abbe Condenser NA 1.25 with aspheric lens. Iris diaphragm with Frosted white filter. Rack and pinion movements on stainless steel guides. Coarse and Fine : Co-axial coarse and fine focusing on gear systems for smooth operation. Fine adjustment focusing by 0.2mm/rotation with maximum 2 micron scale increment. Illumination : LED 3.3W/3V with variable control. Up to 100,000 hours of LED life. Electronics : Universal input 110V-240V AC, 50/60 Hz. Optional : Monocular, Trinocular Head, SP series DIN Semi Plan objectives 20x, 60x SL, WF 15x,. Accessories : WF 20x, Pointers & Micrometer Reticules, Phase contrast, Polarizing, Fluorescence and DarkField Attachments, Digital USB Cameras (1.3MP, 3MP, 5MP, 14MP) with in-built adaptors and DSLR Cameras with adaptors, illumination system Halogen 6V 20W.